Weighty Matters: We get mail (Canada's Health Minister responds)! 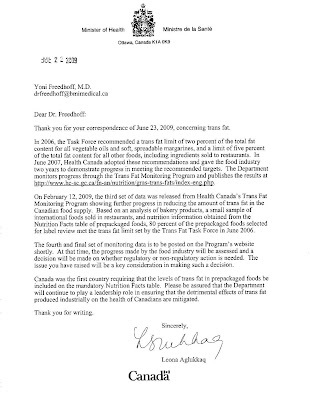 So one month ago I emailed Canada's Minister of Health and pointed out what I see to be the incredible hypocrisy behind Health Canada's recent decisions to ban bisphenol-A and phthalates, compounds which pose at this point primarily theoretical risks to Canadians, while simultaneously twiddling their thumbs asking the food industry to please, pretty please, stop putting trans-fats in foods, a compound the head of Health Canada's own trans-fat task force deemed, "unsafe in any amount". Last week I finally received a response. You be the judge, click the picture above and read the letter for yourself. "we believe it is our responsibility to ensure families, Canadians and our environment are not exposed to a potentially harmful chemical"
yet here with clear and present trans-fat danger they want us to keep waiting? Frankly I would have thought that even if voluntary measures were successful at a marked reduction of trans-fat in the Canadian marketplace that banning a toxic food additive would still be something Health Canada would feel compelled to do - and do in a hurry.